1952 to 1958: sea time with naval cadets and Royal Naval Reserve. Attended many RN practical seamanship courses. 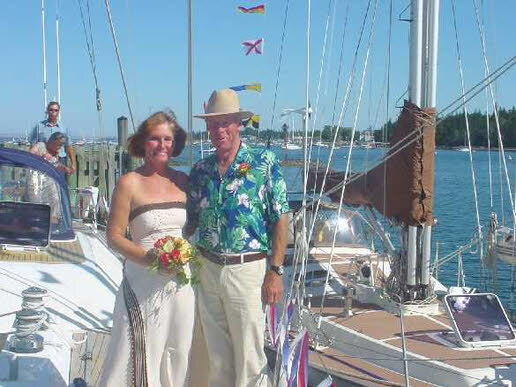 Sailing experience in RN sailing craft to 40 ft.
2006: Maine to Nova Scotia then Nova Scotia coastwise southwards along US east coast to Beaufort NC, then offshore to Virgin Gorda (1500 miles). 4,500 miles in the year. 2007: Cruising in the Eastern Caribbean. Haul out and store ashore in Grenada during Hurricane Season. 2008: Cruising in the Eastern Caribbean, Grenada to BVI/USVI. Haul out and store in Tortola for Hurricance season. Chartered a boat in British Columbia to sail in Desolation Sound for OCC Rally. Autumn 2008 cruising in BVI/USVI/Spanish Virgin Islands. 2009: Cruising in USVI/Spanish Virgin Islands. Puerto Rico to Bahamas, then northwards E coast of USA from Florida to Maine. 3,500 miles in year. My mother always tells the story of how standing in the hot sun to watch the young Princess Elizabeth process through the streets of Durban with her royal parents in 1947 almost precipitated my birth! However, I’ve always had a good sense of timing, so arrived when planned, where planned, at the small hospital in Eshowe, Zululand, to very little fanfare. Apocryphal stories have been passed down through the family for so long I don’t really know whether they are really memories or just pictures of stories! Like being flung through the air by my mother to escape being bitten by a snake; like sitting atop a pile of suitcases in a little Anglia all the way from Durban to Broken Hill in N. Rhodesia in 1952, squashed in by my mother’s Singer sewing machine and my baby brother’s carry cot; like meeting elephants on the road on the same journey – I definitely remember being frightened out of my skull by the plate-sized spiders on the walls in this new land! Wonderful memories of colonial life follow: even as blue-collar workers, my parents had at least two full time house servants and several gardeners. I never did anything for myself – dropped my clothes where I shed them, giving no thought to how they miraculously appeared again, washed, ironed and neatly folded. Baths were run, food appeared – and if I didn’t like what was on the dinner table, I could always run to the khaya at the back of our house, and share corn on the cob cooked over the open fire with the houseboy’s kids! A very free and easy life. At age 12, I left for boarding school in Pietermaritzburg, a three-day train journey which involved 2 changes of trains and 3 border crossings. I had no passport, just a letter written by my Dad to say I was travelling to school – try to get away with that today! Leaving school, I’d planned to go to university, but ended up getting married instead. Ian Crickmore-Thompson is some 11 years my senior, an only child from a large extended family and a grandmother, Ma who terrified the daylights out of me! Tiny, fierce, determined and wilful old lady, she ruled the roost of 8 children and spouses, and umpteen grandchildren. No-one argued with her; not the mayor, not the local priest, certainly not her own family. And for sure not me, the newest addition! In pretty quick succession, Ian and I had 3 children, James, Tracy and Garth. And suddenly I found myself having to do all those things that had always ‘been done’ for me before – I now had to do the cooking, the cleaning, the washing, the ironing. And with not much income, there was no money for servants now! Not too surprisingly, Ian’s first Christmas present to me was a large yellow Mrs. Beeton’s cookery book. Things did improve, but I have never ever laid claim to being a natural or enthusiastic housewife. But life generally was good – we had 3 great kids, we managed to save enough each year to take a 3-week camping holiday, and we travelled the country quite extensively during those times. I have always loved travel. Along the way, I picked up two foster boys, brothers who’d been very badly treated by their own family, and they lived with us for some 8-9 years. Unfortunately things went bad with the eldest boy, and we no longer have contact with them. Very sad. It didn’t take long for the round of nappies and social chit-chats over tea and scones to bore me, and I eventually pushed my way back into the labour market, landing up some years later owning my own business, a company called Grace Music. Importers and distributors of Christian Music, supplying the churches, bookshops and music stores with LPs, cassettes and CDs. It was cutting edge stuff at the time: I was on the wave of new things happening in the Christian scene, when the charismatic movement was just starting and there was a noticeable shift away from the ‘way things were’ to something new. This was reflected very definitely in the music being produced, and as stars the likes of Noel Paul Stookey of Peter, Paul & Mary, and Billy Preston (the 5th Beatle) became ‘born again’, the style of music being sung by and to the church changed too. Not that the church wanted it, of course! One of my claims to fame is of being ‘escorted out’ of many churches for playing so-called ‘devil’s music’ to the youth! But for some 24 years, Grace Music pushed the envelope, always with the end result of reaching out to young people who would not listen to the gospel message when couched in traditional terms. It was an exciting period, entailing much overseas travel and many late nights behind a sound desks in some recording studio. At the same time, my kids were growing, with lots of demands of their own, and the country was changing from an apartheid-based system to we were not sure what, creating pressures of a different sort. A lot was going on, and something had to suffer. Inevitably it was the marriage that did, as Ian and I grew further and further apart – never enemies, just no longer a couple in anything but the vaguest sense. It was almost a relief for both of us to finally get divorced. Some 14 years later, a lifetime later, I had bought a beautiful 52 hectare property out in Broederstroom, some 50 kms from Johannesburg, closed Grace Music down, now had 4 fantastic grandchildren and a horde of dogs and cats, and was freelance editing, working for several publishers, when I answered an ad in a sailing magazine for crew for a trip to the USA and back. Why? Who knows! It seemed like the right thing to do at the time! I wasn’t a sailor, had in actual fact never been on the sea in my life, but didn’t crewing a little 19 foot day sailor on the lake count for something? And in the back of my mind there was a long-forgotten dream of one day sailing the world’s oceans. Of course, by the time my postcard from SA got to John Franklin in the UK by fork-stick-and-runner, he’d already selected his crew out of the some 20 or so applicants, and it wasn’t me. Disappointed, but not surprised, I moved to Cape Town temporarily, decided I liked it, and stayed. An occasional card would arrive from John, I’d get an occasional email report of Al Shaheen’s travels – it all sounded very exotic and very far away. At this stage, I couldn’t have pointed out where the Caribbean was on a map! Then suddenly, things changed. John’s relationship with his lady crew had crashed, I was going to Vancouver to see my son James, and we decided to meet en route at Heathrow. So are life-changing decisions made! By the time I left for Vancouver, it was a given that I would be sailing with him for the next season (October 2004 to March 2005). All I had to do was close down my life in S. Africa, rent out all the houses on my property, say goodbye to family and friends, sort out what business I could still do on the boat – and take off for shores unknown. Oh, and fit in an RYA day skipper’s course too. And that’s what happened! 31st October I landed in Grenada via Cape Town, Johannesburg, Lagos, and Tobago – into the maelstrom of mud and rain and wrecks that was the end of Hurricane Ivan – and stepped aboard Al Shaheen to take my first ocean voyage. The rest, as they say, is history. In Charlotte Amalie, just before my 6 months were up, John proposed – just before we hauled out in August 2005, we were married in South West Harbor Maine. It’s been a whirlwind life, the past few years! And I’m loving it.